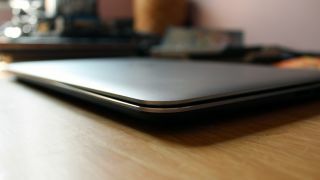 If you were a fan of last year's Dell XPS 15, you'll be excited by the specs leaked for next year's model. The enhanced laptop, which will reportedly once again feature Dell's Infinity Edge borderless screen, will weigh only 3.7 pounds (1.7 kg). This is a nice reduction from last year's model, which weighed 4.1 pounds (1.88kg). Like most other premium laptops set to be released later this year, the XPS 15 is expected to feature Intel's sixth-generation Core i5 and Core i7 Skylake processors, an upgrade over last year's fourth generation processor. Similar to last year's model, the higher-end XPS 15 is expected to feature a QHD+ 3840x2160 resolution touchscreen. The entry-level model will feature a full HD (FHD) 1920X1080p non-touch display. According to the leak, the laptop will also come with an Nvidia GeForce GTX 960M graphics card, 16GB of RAM and up to 512GB of SSD storage. In terms of connectivity, you'll get two USB 3.0 ports, HDMI output, full SD card reader and Bluetooth 4.1. We love last year's version of the XPS 15. It is a well-balanced machine that has a gorgeous screen. However, we weren't impressed by its 3 hour and 30 minute battery life, or its price tag, which is about $150 more expensive than the MacBook Pro. Hopefully Dell, and the new Intel processors, can bring the next-generation XPS 15 a few more hours of productivity on a single charge. US residents will be able to order the WQHD+ version of the XPS 15 starting this week, the report says. The touchscreen version of the laptop will start at $1,800 and max out at $2,200. The FHD model, and all European versions of the XPS 15, will be released later in the year. However, it is immediately unclear when the releases will happen. We have reached out to Dell and we will update the piece if we hear back.